This is Halloween, This is Halloween...What's this? What's this? Christmastown! 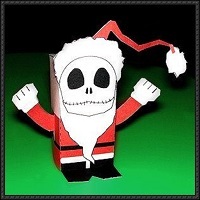 Okay crafty friends here is a holiday challenge, create a Nightmare Before Christmas themed 3D paper craft of your choice. Any character, either persona, and send it off to one partner. 3D crafts are inclusive of but not limited to flip books with pockets and layers, wands, pocket letters 9 or 3 with external embellishments, wall pockets filled lightly, fancy cards with pop up or out elements, hinged paper dolls, paper jewelry beads, fancy, fancy origami, quilling, matchbox, paper boxes etc. You don't have to be a great artist although drawings are welcome in this craft and paper is required, any additional medium or mix is acceptable as long as true effort is made. Pens, colored pencils, markers, paint, decoupage, stencils, stamped images, pasted elements, doodles, embellishments or stickers combined with other items, use your imagination. The design is up to you and please remember to include the swap name and yours. Wow, I would love to do this swap but that is not nearly enough time to complete a project. Is there any chance you could extend the date on this?